Check Certificate - Error box came up "could not check SSL certificate status." with details stating "the underlying connection was closed. The connection was closed unexpectedly". Install Certificate - Pop up prompted me to confirm installation of SSL certs, I said yes. After first use of this option, nothing happens. As for my setup, I'm on Win7 Pro x64 with a typical Netgear router connecting to comcast via a typical cable modem. I do notice that the cert files in my net-7\bin folder are really outdated, should those be more recent? Edit - Some additional relevant info and screenshot of error when checking certificate. 20:34:59: Could not send HTTP request. 20:34:59: GetTicketSync(1) failed with IAUTHORIZE_BAD_CONNECTION. Message: Could not check ssl certificate status. sunrise is using certificate from letsencrypt and is currently valid. I've taken a look at my installed certificates and don't see anything pointing to net-7.org but I do have one for "Let's Encrypt Authority X1" in my intermediate cert list. When I use the "install certificates" option in the launcher, nothing happens. 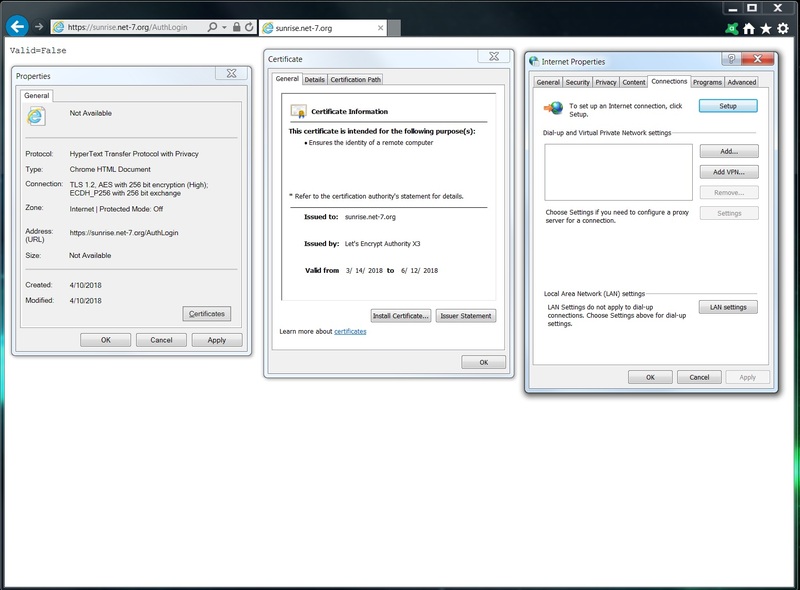 Open https://sunrise.net-7.org/AuthLogin in Internet Explorer and see what that one tells you about certificate. I take there is no host overrides in c:/windows/system32/drivers/etc/hosts files and proxy settings (IE options) is set to manual and you dont use malware disguised as internet security suite (https man-in-the-middle proxy). No idea whats causing the game cert error then. Thanks again for the help. I've checked and there are no hosts overrides that I can see (everything in the hosts file is commented out). proxy settings are unchecked in internet options, and as far as I know I don't have any malware problems. I did try reinstalling Net-7 using the unified installer, but I am unfortunately getting the same results. Should I delete my net-7 folder completely and try again? My recommendation is a full uinstall and a reinstall if it's been a while. There's no telling what kind of conflicts have arisen since you were last around and it'll probably be less painful for you unless you just enjoy figuring out the problems. I went ahead and deleted my net-7 installation (and the app data from my users folder) to reinstall net7 from scratch. Unfortunately I'm still getting the same errors, and the "install certificate" help option still isn't doing anything. Sorry to be a bother but I'm still not able to get in. I used the https://sunrise.net-7.org/AuthLogin page to check my certificate status and while my browsers tell me the certificate I have is installed and valid, I'm still getting valid=false from that page. I've reset my game account password twice to make sure it's not my game account data that's wrong, but it's still not letting me login. I've reinstalled Net-7 completely (deleted my old Net-7 folder and the user data folder) and after it did the launcher updates, I still get the same error. If there's any info I can provide that can help, I'll gladly do so. That is it, I checked the page source, no html tags, just that plain text. The browser shows the certificate is valid. You people happen to have HKEY_LOCAL_MACHINE\SOFTWARE\EACom\AuthAuth registry key perhaps? .. or maybe AAIUrl in EnB\data\client\ini\auth.ini file does not point to right place? Launcher should modify it, but maybe there is permission issues. If you know what wireshark is, then it would be interesting to know which certificate is served when client tries to connect. auth.ini is correct, authlogin.dll has registry keys inside, but game probably ignores them. IE (not chrome, not firefox, not edge... I do mean IE) connects to https://sunrise.net-7.org/AuthLogin fine. IE proxy settings are off. You do not run thrird party internet firewall / packet filtering. Your router/ISP does not do https man-in-the-middle attack (changing certificates) to inspect https. No idea. Install windows into VM (from microsoft) and check it there? Dont know how directx7 (i think) is supported in those. 1. No overrides in hosts file. Just one entry for a local machine. 4. I Have Avast, but I selected 'disable all shields' for 1 hour. I also uninstalled the IE plugin, no change. Looking at your logs, it looks like AuthLogin failed with error 12057 which is usually thrown when a CRL verification fails (Certificate Revocation List check). The only reason that this should fail on your systems and not for other people is if your system time is incorrect. Please ensure that your system's time and date are correct (use Windows' "Set Time Automatically" option if you need to, or if it set the clock incorrectly then set it manually). After changing system time, reboot your system and try again. In this section, please uncheck "Check for server certificate revocation" then hit Apply. If the above method (disabling server certificate revocation check) fixes your problem, I would still advise turning it back on (for security reasons) and just letting us know if that fixed the problem for you so that I can investigate further. Zackman & Kenu - We may need to have these two enable and upload their Windows CAPI2 logs. authlogin.dll uses HttpOpenRequestA, HttpQueryInfoA, and HttpSendRequestA from WININET for this process. These all utilize CryptoAPI2 which has diagnostics/logging available in Events/Applications and Services Logs/Microsoft/Windows/CAPI2/Operational (you have to enable logging, it's disabled by default). 1. Registry item - I do not have an \EACom\ folder under the HKEY_LOCALMACHINE\SOFTWARE path, so I can't check this. Is it possible this was missed during installation due to permissions? 3. I've captured wireshark data for my attempts, but I'm not familiar with using the application so I'm not sure how to get what you're asking for. Should I just send you the capture data? Regarding internet security apps, I have nothing installed other than what comes with Win7 Pro (windows firewall basically) so I don't think that's the issue. Alright well that at least helps narrow the problem down a little bit. I would be interested to see what your CAPI2 logs contain once you re-enable server certificate revocation checking. Once CAPI2 logging has been enabled and the CRL checks are re-enabled try getting the INV-300 on EnB again, then navigate to CAPI2/Operational again and see if any events have been generated. There shouldn't be any personal or dangerous information but feel free to look through it yourself first to be sure if you're worried. You can also just message me the data in a private message. Here's the CRL info from his CAPI2 log. KSerge & tsaavik: Can you both check your User Certificate store? Open the User Certificate MMC console by opening the Control Panel, searching for 'user certificate' and clicking 'Manager User Certificates'. Rename the certificate to use the .cer extension rather than the .pem.txt extension. Choose the "Place all certificates in the following store" option and store it in "Intermediate Certification Authorities"